As a wedding officiant, I often hear engaged couples say that they had to add “something” to their wedding ceremony for the “the grandmas or the aunties.” I understand the desire to have a unique, modern wedding and also keep the family happy knowing that their traditions are remembered and honored. Here is a bride who really rocked the traditional values of her family, the Pechanga band of Native Americans, and had a lot of fun with modern style and flair. It began with the “time” the wedding ceremony was to begin. The wedding invitation said, “5:00 pm.” That actually means anytime from 5:30 to 6:00 pm if you are a family member. This smart bride had native dancers begin at 5:00 pm and all the guests who arrived “on time” were treated to amazing young dancers “flying” between the grass and trees of this beautiful wedding venue. I was the “modern” part of the ceremony as a woman wedding minister. 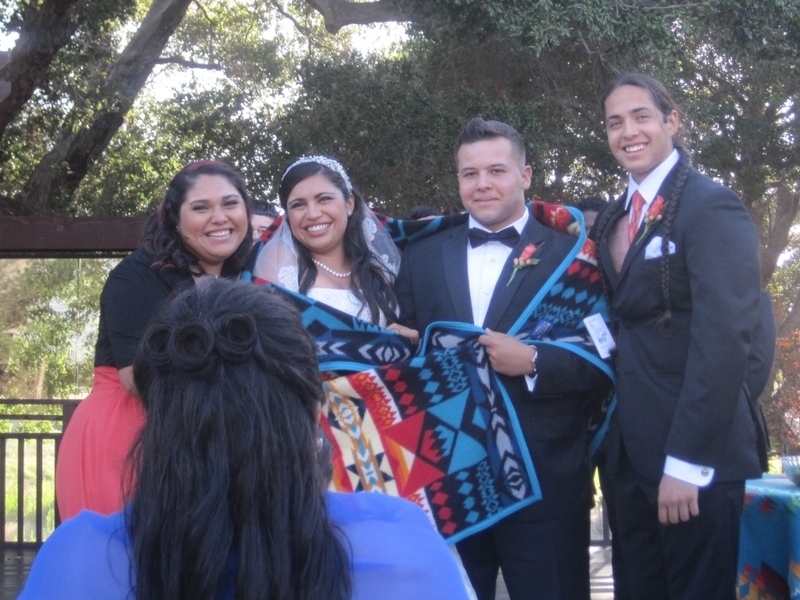 In that role, I had the joy of inviting one of the elders of the community to offer a traditional native American wedding blessing between the ceremony of drinking from the traditional wedding bowl and being wrapped in a beautiful family wedding blanket. It was fun. It was modern. Most important of all though, it was so much fun for this bride and her Marine!